Between June 15 and September 1, 2019, UCCA Center for Contemporary Art, Beijing, presents “Picasso – Birth of a Genius,” the most significant exhibition of work by Pablo Picasso (1881-1973) ever to take place in China. The exhibition, which offers a comprehensive overview of the first three decades of Picasso’s career, includes 103 works drawn entirely from the collection of the the Musée national Picasso-Paris, which trace Picasso’s development from childhood to middle age. Curated by Emilia Philippot, Head of Collections, Musée national Picasso-Paris, the exhibition has been conceived and organized specifically for this presentation at UCCA and in China, and includes paintings, sculptures, and works on paper. Taken together, this selection of works realized between 1893 and 1921 constitutes the core of the exhibition and tell the story of the creative formation and evolution of the most daring, original, and prolific talent in the history of modern art. The three decades under consideration here were a period of artistic discovery and ferment for the young Picasso, whose style underwent numerous changes, from the academic realism of his student days to his post-war return to classical style; from the alternately somber and carnivalesque motifs of the Blue and Rose periods to the primitivistexplorations which ultimately led to the multiple phases of Cubism. Rather than rigidly separating Picasso’s work into different thematic sections, the exhibition seeks to reaffirm the coexistence of several seemingly contradictory languages in his creative process, and to highlight the lived realities behind them, which exceed the period. This is the reason why theshow also proposes to present subsequent works through 1972. 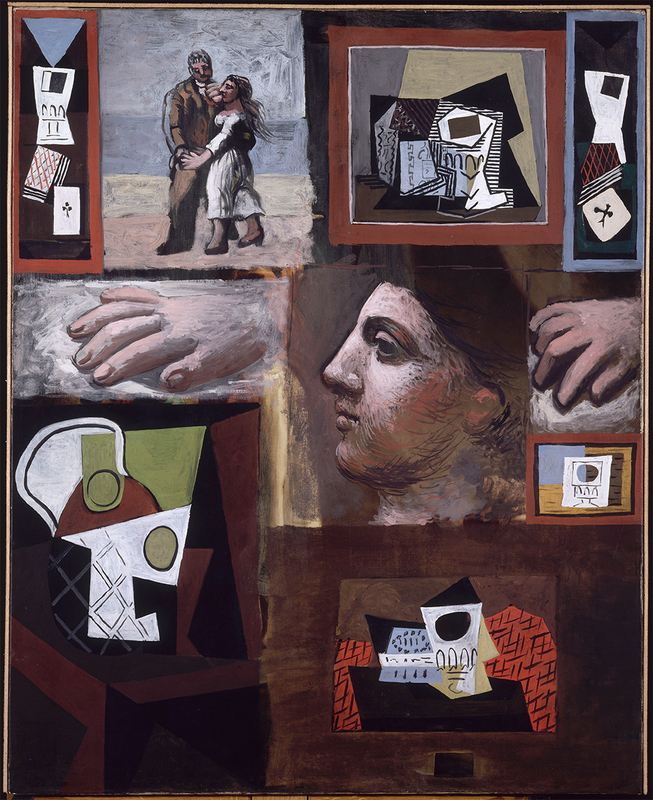 “Picasso – Birth of a Genius” is organized in six chapters: “The First Picasso,” which accounts for the artist’s artistic upbringing, when he produced works such as Man in a Cap (1895) and Study of a Torso, After a Plaster Cast (1893-1894); “Picasso Blue and Rose,” during which he advanced from imitating Post-Impressionist masters to develop a truly original style, resulting in works like The Jester (1905) and Two Brothers(1906); “Picasso the Exorcist,” which saw his revolutionary experiments with form and space, producing artworks like Self-portrait (1906) and preparing his masterpiece, Les Demoiselles D’Avignon (Museum of Modern Art, New York, 1907); “Picasso the Cubist,” a period when he wrought an elaborate system of signs, producing works such as The Mandolinist (1911) and Man with Fireplace (1916); “Picasso the Chameleon,” which marked the artist’s turn towards classical revivalism, creating works such as The Lovers (1919) and Studies (1920), as well as designing the sets, costumes, and curtain for the Ballets Russes production of Le Tricorne (1919); and a final section which includes several notable paintings and sculptures done between 1927 and 1972, giving a sense of how Picasso’s creative idiom, developed during the period under consideration in the exhibition, informed his later practice. As French Prime Minister Edouard Philippe has highlighted to Premier Li Keqiang during their meeting on June 25, 2018, the exhibition represents a significant contribution to the bilateral cultural dialogue between China and France. It echoes President Macron’s wish, pronounced during his visit to China last January, to see more exhibitions from major French museums come to China, and from Chinese museums to France. On March 25, 2019, President of the People’s Republic of China, Xi Jinping met with President of the French Republic, Emmanuel Macron at Élysée Palace, and expressed the need for increasing cooperation between the citizens and governments of France and China in the fields of art and culture. Xi stressed the need to promote extensive bilateral exchange in the humanities, and to increase dialogue with regard to culture, tourism, language, and region, reaching out to younger audiences in particular, and designated 2021 as the year of Sino-French cultural tourism. For the Musée national Picasso-Paris, the exhibition marks the most substantive presentation of its collection—which includes 5,000 art works and more than 200,000 archival objects—in China to date, and the first since Laurent Le Bon assumed the directorship in 2014. “We are pleased with this new stage in the international cooperation policy led by the Musée national Picasso-Paris,” LeBon has noted. To honor Picasso’s frequent collaborations with musicians and performers, on June 22, July 20, and August 24, UCCA will host an exhibition-themedart festival, including performances, screenings, and lectures which explore the artist’s unique contribution. In addition, it has organized a symposium on “Picasso in China,” set to take place on June 15, convening speakers such as Emilia Philippot (Head of Collections, Musée national Picasso-Paris), Cai Tao (Professor, Guangzhou Academy of Fine Arts), Wu Xueshan (Associate Professor, School of the Humanities, Central Academy of Fine Arts), Yu Zhongxian (Researcher and Ph.D. Advisor, Institute of Foreign Literatures, Chinese Academy of Social Sciences), and José Lebrero (Artistic Director, The Picasso Museum in Malaga) to discuss Picasso’s influence on both the Chinese and international art worlds. In addition, UCCA will publish a bilingual catalogue for “Picasso: Birth of a Genius,” including original essays by curator Emilia Philippot and Wu Xueshan on Picasso’s enduring legacy both in China and beyond, as well as high resolution images of all 103 artworks exhibited. UCCA Kids will also offer a series of children’s art education programs designed specially for this exhibition. Children can participate in a guided tour and an art workshop after purchasing a bag of art materials; all proceeds will be used to support UCCA’s mission to bring art to children of different backgrounds. Musée Picasso’s considerable collection was established after two donations made through “acceptance in lieu,” an alternative to inheritance tax, by Picasso’s heirs in 1979, and later by the heirs of his widow, Jacqueline, in 1990. This is the first major endeavor that the Musée Picasso will have undertaken in China since its institutional revitalization in 2014, under the leadership of new director Laurent Le Bon, and his novel curatorial framework. “Picasso – Birth of a Genius” early bird tickets are now on sale; visitors can follow UCCA’s Official WeChat Account for discounted prices.